Spring Break is wrapping up and we get to send the kiddies back to school on Monday. Carlisle Daily is curious what did you do with your kids on Spring Break? We are at Coco Keys in Sharonville all of today and tomorrow. In fact, we saw at least a dozen or more Carlisle folks this week! You know who you are!! It was an inexpensive way to spend a few days away with the kids! And our kids had a blast!! What did you do? Did you attend Opening Day? Coco Keys? Did you head to the beach? Consider this Carlisle Daily's first Community Chatter!! Click on the comment and let us know! Coco Keys!!! We all had a blast!! Saw plenty of Carlisle folks!! Went to Pigeon Forge Titanic, Zip Lines, Ripley's Aquarium and wonderwork. 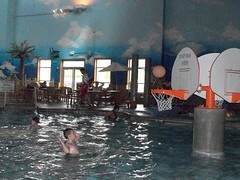 Along with the pool in our cabin the kids had a great time. Going to do it again as soon as we can. within my community, who does not? I will also demonstrate how to do that.